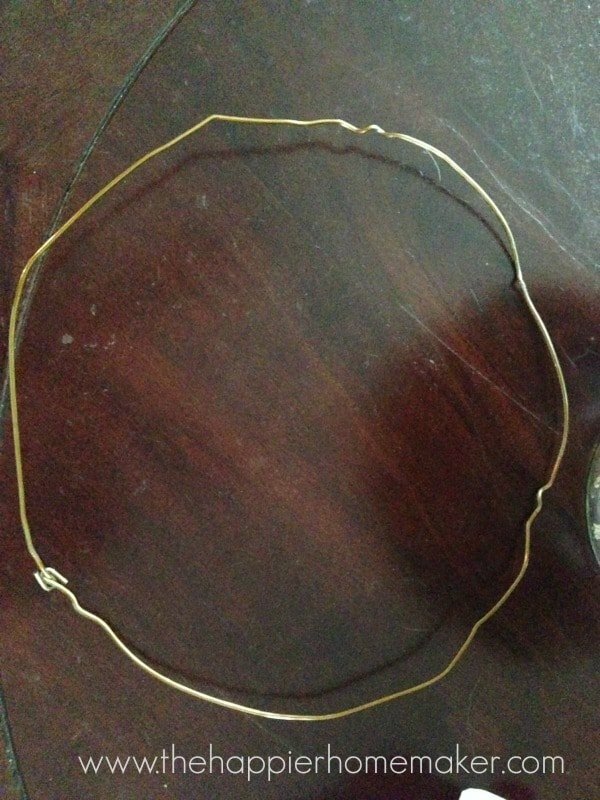 Disassemble your wire hanger and form it into a circle. 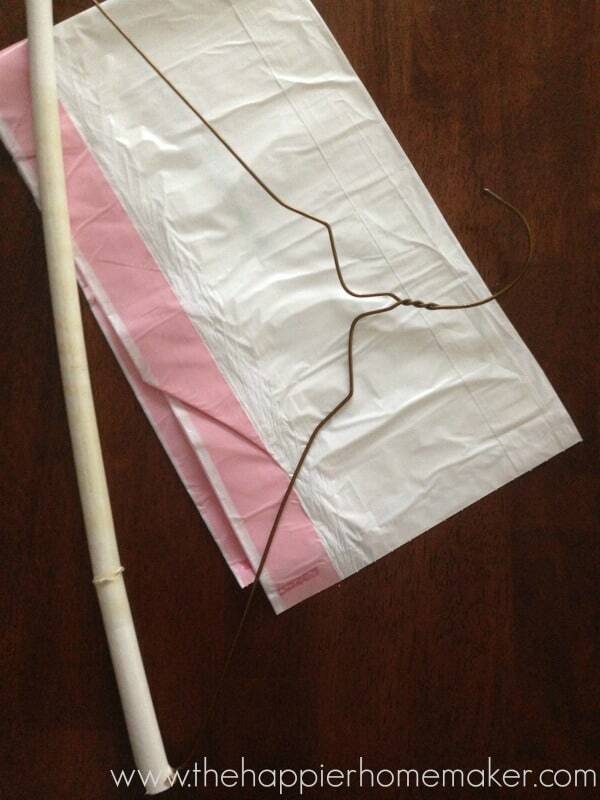 Use pliers if necessary to shape the hanger-and no need to worry about perfection, the bags will disguise any wonky parts! 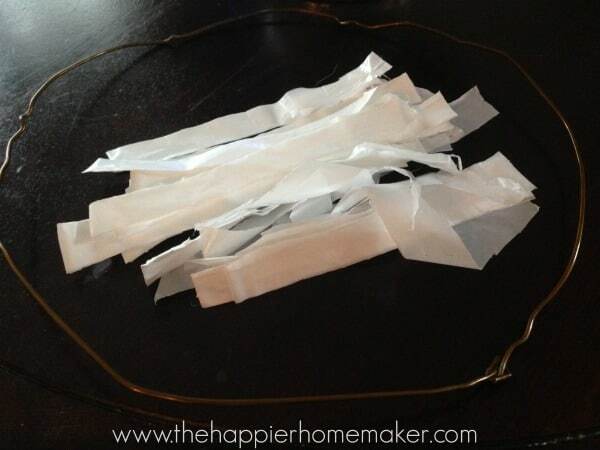 Cut the trash bags into strips 1/2″ wide and about 5-6″ long. I cut my bags while they were still folded up right out of the container to save time. That’s it! 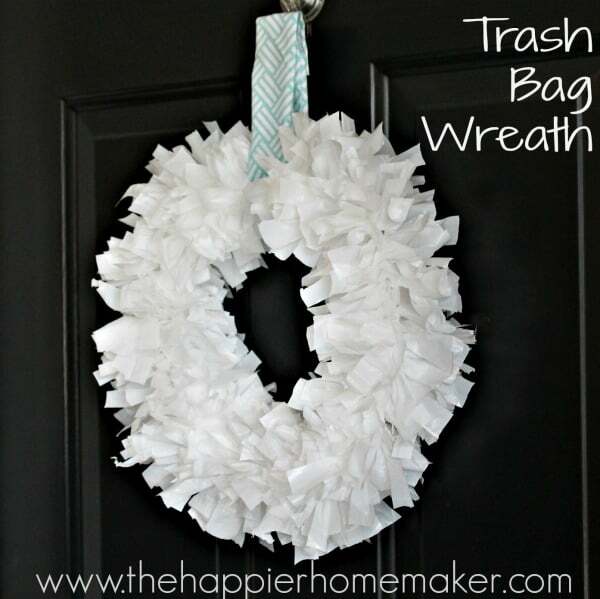 A little time investment and about a dollar’s worth of trash bags and you’ve got a versatile and durable wreath! I think it looks a lot like my last coffee filter wreath but I feel like this one will last longer due to being mad efrom plastic instead of paper. To hang my wreath I simply used hot glue and a fabric scrap to form a loop around my wreath and then cut a hole in my fabric to form a place for my suction cup hook to be placed. Easy peasy! I hope y’all like this DIY, see you in 2014!! I. LOVE. IT! So easy and totally adorable. I’m going to make one. Do you mind if I share your project on my blog? Thanks Marie! You’re more than welcome to share one pic with a link back! Happy new year! I can’t believe that is trash bags! It turned out so pretty and perfect to stand up to the sun or the outdoors! Adorable. How cute! I’m picturing a black trash bag with a red fabric sash! The possibilities are endless aren’t they?! So sorry, I just saw this- it went to my spam folder! Very cute! 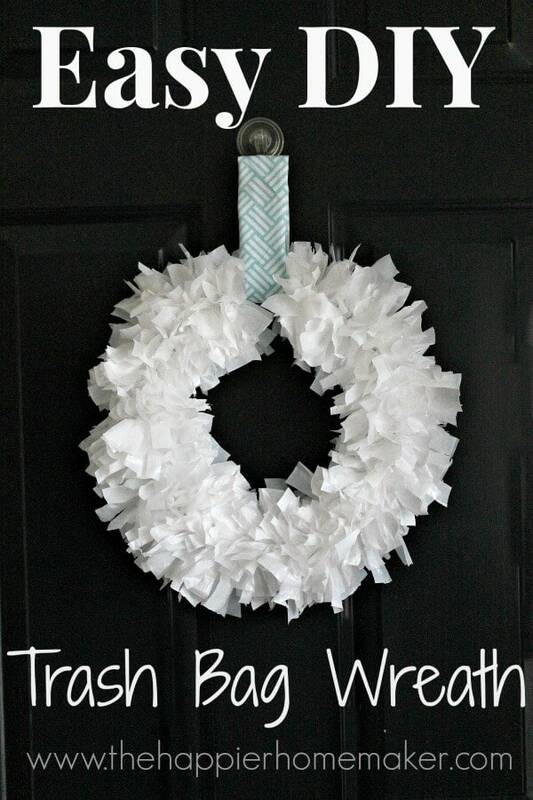 I love white wreaths in the winter! I just made one! I love it! I’m going to share and link back over to your page! I just had to comment when I saw these wreaths- My mom had my sister and I making these when we were little- back in the 60’s! It brings back fond memories of sitting on the living room floor in front of the TV. I can still smell the plastic as we tied, and tied, and tied. Ours were made with clearer plastic bags and decorated with little red balls. That’s so cool Leonora! Thanks for sharing, I bet they looked great, I’m going to write myself a note to try it with the clear bags next time! Sometime during my elementary years, I made one of this trash bag wreaths for my mother. It hung in our kitchen each Christmas. Looks like I’ll be making another one for me! A bright white wreath will look awesome on my red front door! Thanks for the memory and the inspiration! That’s awesome Ashley! I am definitely thinking that this wreath will last forever, so much more durable that the coffee filter wreath I made recently! Well…this is so original! I just wouldn’t guess that this is recycled trash bag! Such a good idea! I will make something like this for my daughter’s room. She loves when I start some DIY project and she always wanted to participate. It is something like mother and daughter thing, so thanks for the idea! You’re so welcome Rachel, I hope you both have fun making it! Wow! Thank you for this diy! I had never seen this before. I tried it and I am so pleased with the results. I used the black bags for a wedding reception to place on the front entrance with the couples initials. They look so beautiful better than what I was going to use. I used 2 – 13 gallon trash bags for each wreath and it took me about 3 hours including cuting the strips. I will be using this idea for the holidays! I’m so glad you liked it Denise!! Your version sounds very pretty! One of the most creative ideas that i have ever seen, love to see how people are unfolding incredible ideas from their trash bags. Gotta try sometime, too. Keep up the god work ! !